Dr. Salah Abdalla is a Professor of Microbiology and Public Health in Heliopolis University for Sustainable Development. 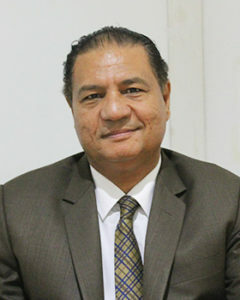 He earned his bachelor’s degree in 1979 and his master’s in 1983 from Assiut University. In 1987, he received his PhD degree from Montpellier University and Assiut University. He was promoted to an Associate Professor in 1992 and then full Professor in 1998 in Suez Canal University. His research interests include Nosocomial diseases, antibiotic resistance, pathogenesis, pathology and epidemiology of infectious diseases, molecular biology, mobility of genes and microbes, drug discovery, viral diseases e.g. rotavirus, and immunology. Spanish Society for Infectious Diseases and Clinical Microbiology (SEIMC). Egyptian Society for Pharmaceutical Sciences. Egyptian Society for Zoonotic Diseases. The British Society for Antimicrobial Chemotherapy. The Spanish Society for Pharmaceutical Analysts (AEFA). American Association for Clinical Chemistry (AACC). Hany Hashem, Amro Hanora, Salah Abdalla, Alaa Shawkey and Alaa Saad (2017). Dissemination of metallo-b-lactamase in Pseudomonas aeruginosa isolates in Egypt: mutation in blaVIM-4. APMIS (actapathologica, microbiologica, immunologica Scandinavia). DOI 10.1111/apm.12669. Hany Hashem, Amro Hanora, Salah Abdalla,AlaaShawky,and AlaaSaad. Carbapenem Susceptibility and Multidrug-Resistance in Pseudomonas aeruginosa Isolates in Egypt. Jundishapur J 2016 November; 9(11):e30257. Published online 2016 October doi: 10.5812/jjm.30257. Shymaa Enany, Salah Abdalla. In vitro antagonistic activity of Lactobacillus casei against Helicobacter pylori. Brazilian Journal of Microbiology 46, 4, 1201-1206 (2015). SawsanZaiton, S Abdalla, 2015 et.al. Antifungal effect of silver nanoparticles versus miconazole oral gel/suspension in experimentally – induced oral candidiasis in rats. Noha M. Elkayal, Nora F. Mahmoud, Salah Abdalla, 2015. Detection of Chlamydia trachomatis and Neisseria gonorrhoeae in Egyptian Women Suffering from Infertility. Advances in Microbiology. 5, 769-779. Aya Ahmed Ali, Marwa Mohamed Azab, Salah El-Din Mohamed Abdalla, 2015. Identification of Candida albicans causing candidiasis using multiplex PCR. American Journal of Research Communication. Vol 3(3). Sarah Shabayek and Salah Abdalla. Macrolide- and tetracycline-resistance determinants of colonizing group B streptococcusin women in Egypt.2014. Journal of Medical Microbiology (2014), 63, 1324–1327.